There are various types of diamond ring settings available with the jewelers. To know about the different types of engagement ring settings, read on. 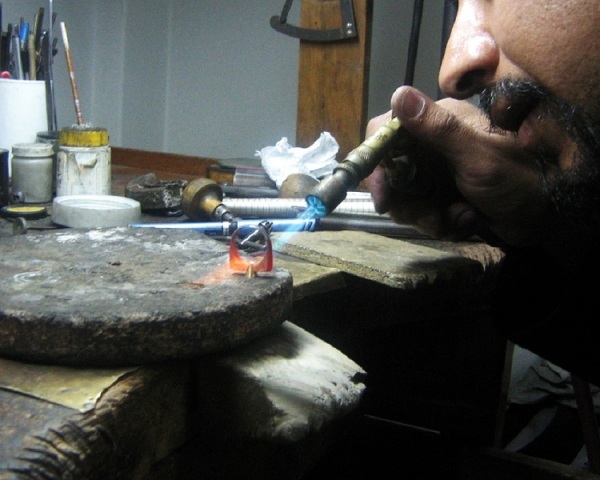 Ring setting is basically the process of infusing a stone or diamond with the metal, in order to create a design. Different types of settings produce different type of appearances, which can be traditional, modern or contemporary. You can either choose a setting from amongst the ones on display or if you already have one in mind, you can ask your jeweler to design a ring for you based on the setting. Moreover, it should be remembered that choosing an engagement ring setting is of prime importance as it decides the look of the ring. For best results, personally visit a jewelry shop and try the different rings on your hand to know which one suits you the best. Initially designed in 1886, the classic prong setting is quite popular for solitaires. In this setting, the diamond is set in a metal basket, secured with three or more prongs or claws, making it look as if it is hanging. Prong setting increase the diamond's sparkle and even make them easy to clean. It is a good choice for larger diamonds, but not for smaller ones. Six prongs is the most desirable number for security and symmetry. However, prongs get caught on hair and clothing easily and even get bent or twisted, increasing the chance of losing or damaging the diamond. Another variation on the prong setting is the bar setting. Instead of individual claws, prongs on each side of the setting are fused into elongated bars to hold the stone in place. Bar setting is a nice way to highlight the metal more, but it does not hold the stone well. In bezel setting, a metal band encircles a circular diamond, to hold it in place. It provides a good protection and is known for its durability. The metal accentuates the diamond, making it look larger than that in a prong engagement ring setting. Bezel setting provides a very smooth surface and does not hook on hair or clothing. However, there is a disadvantage that it is usually more expensive than prong setting. In a flush setting, a tapered hole is created, setting the diamond in, with the surrounding metal pressed around its rim. The metal does not fold over the top of the stone. Flush setting provides a nice protection to diamonds, along with a smooth, sleek surface. Though it gives a tailored and contemporary appearance, the risk with it is that if done improperly, it can easily loosen the stones. Tension settings are used with ultra-strong metal, where the band of the ring is the only thing that holds the stone in place. For added safety, small grooves are carved into the edge of the band, where it intersects the stone. The end result is the startling appearance of the diamond. Tension settings are quite expensive as they are individually sized. In case of resizing, the necessary strength required to protect the stone will be lost. Channel settings are widely used for accent stones or simple rings, where an overall center stone or single focal point is not required. In this type of setting, diamonds of similar size and shape are used in round or princess cuts. The stones are lined in a channel inset into the ring’s band, with a narrow strip of metal along the sides to hold them in place without prongs or bars between them. As the stones are inset, it is a very safe setting option, but it does not highlight the gems properly. Those looking for a modern option should opt for an invisible setting. Here the stone is attached to the ring without any direct visible means. The setting involves a stable position for the stone to rest in, which is attached to the band in a bypass or split design. While the effect produced is similar to a tension setting, the ring can be resized easily. Pave setting rings are popular because of their exquisite elegance and beauty. This design covers the entire surface of the ring with gems, which are either set into a minute depression or secured with thin, unobtrusive prongs. As it involves a number of diamonds to create this design, these rings are quite expensive. As the name suggests, a cluster setting design presents multiple stones, especially semi-precious gems, in a figural design such as a flower or butterfly. Cluster setting is also used where many small stones are combined to create the illusion of a larger gem, without actually using an expensive single stone of higher carat weight. In a varied setting, two or more settings can be applied on a single ring, usually with the center stone highlighted above smaller accent stones. As these multi-settings are highly intricate, they tend to become more expensive. However common designs, such as a central prong setting flanked by channel-set accents, can be easily found in affordable bridal sets.